Florida International University (FIU) is seeking a business partner to develop and commercialize Antibacterial Compounds Targeting Bacterial Topoisomerase I. These compounds are derived from a novel topoisomerase inhibitor scaffold that is distinctive from other previously known topoisomerase inhibitors, thus avoiding potential problems of non-selectivity and cross-resistance. The topoisomerase I activity has been shown to be essential for bacterial viability and infection in a murine model of tuberculosis. Tuberculosis (TB) infects 9.6 million people a year and causes 1.5 million deaths each year. 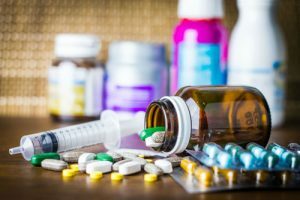 The problem presented by multi-drug resistance is illustrated by the 480,000 cases of multi-drug resistant TB (MDR-TB) that do not respond to first line treatment drugs, with around ten percent of these cases being extensively-drug resistant tuberculosis (XDR-TB) that are resistant to even some of the second line drugs. 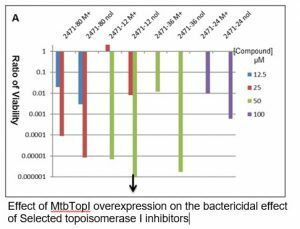 Antibacterial compounds targeting topoisomerase I as a novel target may be effective against drug resistant pathogens, including MDR-TB and XDR-TB that cannot be eliminated by current antibiotics. Antibiotic resistance is also a major problem for treating non-tuberculosis mycobacteria (NTM). However, many of the small molecules identified previously as bacterial topoisomerase I inhibitors are DNA intercalators or minor groove binders, which are not considered attractive candidates for antibiotics development. The inventors have developed compounds of different molecular structures as inhibitors of mycobacteria topoisomerase I activity and mycobacteria growth. Antibacterial assays demonstrated that these compounds are bactericidal against Mycobacterium smegmatis and Mycobacterium tuberculosis. 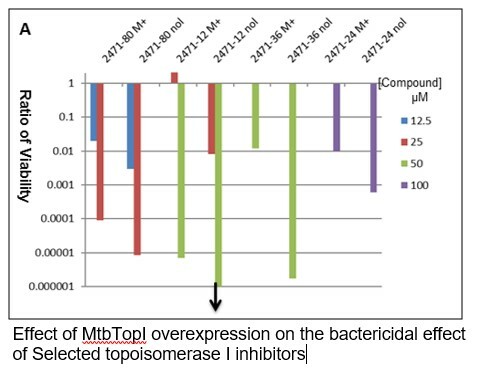 The minimal inhibitory concentrations for growth inhibition of M. smegmatis increased with overexpression of recombinant M. tuberculosis topoisomerase I, consistent with inhibition of intracellular topoisomerase I activity being involved in the antimycobacterial mode of action.